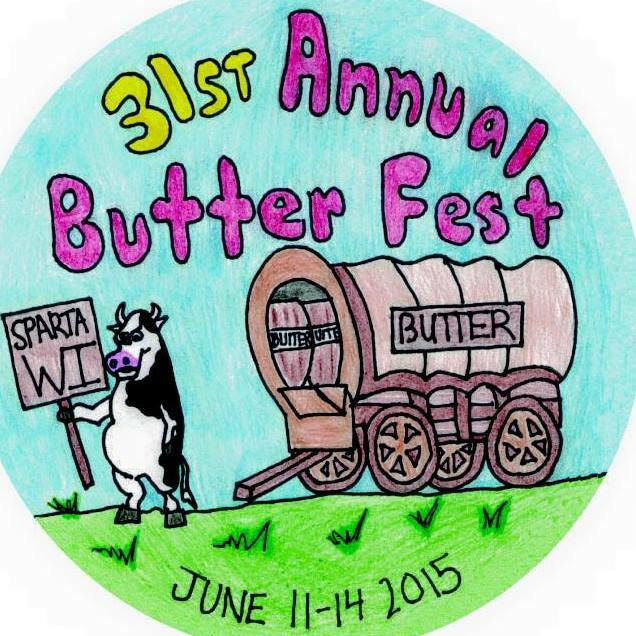 Thank you for an amazing 2016 Sparta Butterfest. We had a great weekend! The Butterfest Pancake Breakfast will be served at the food tent near the south end of the grounds, near the carnival. 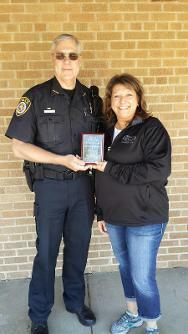 Proceeds will support the newest Monroe County K-9 Unit. Coffee will also be available. 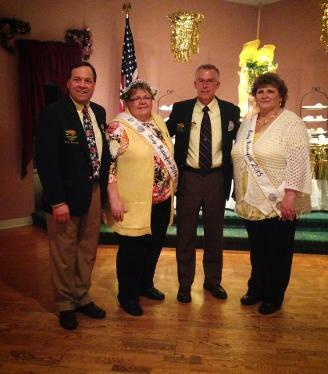 Our heartfelt congratulations to our 2016 Parade Marshal Dave Kuderer! Dave's troop continually volunteers on the Butterfest Grounds and he is an active member of the Sparta Festivals Committee, on top of all the work he does for the community through both his job and his many volunteer activities. Thank you for all you do Dave, and congratulations!!!!! 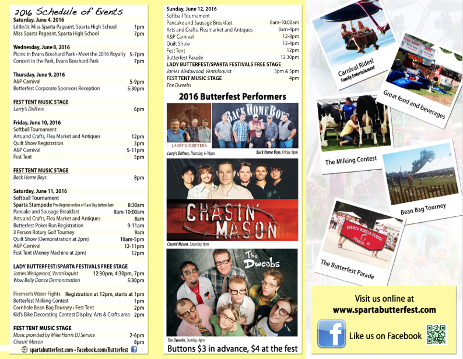 Our 2016 Butterfest Brochure is here! 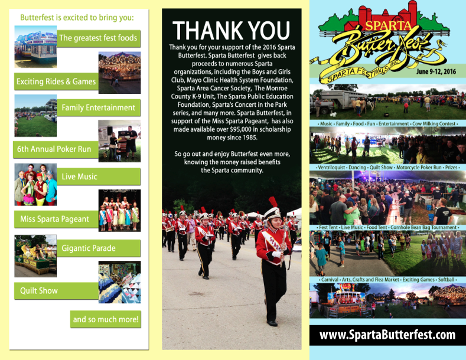 Our brochures are being distributed throughout Sparta and the surrounding area, but catch a sneak peek below! You can also download a copy to your phone by using the links to the right. 2016 Festmaster Reinhard Mueller will be welcomed to the royalty at the 2016 Festmaster's Banquet which will be held at The Colonial. 2015 Festmaster John Hendricks will also reflect on his year. Visiting royalty from local festivals will also be in attendance. Help us celebrate both Reinhard and John on their accomplishments! Tickets are no longer available. Miss sparta informational meetings are coming up! Miss Sparta Informational Meetings will be held on April 2 at The Colonial. Miss Sparta is open to contestants age 16-20 on June 4th 2016, who live in the Sparta Area School District. Contestants in Miss Sparta will compete in interview, public presentation, talent, evening gown and on-stage question. 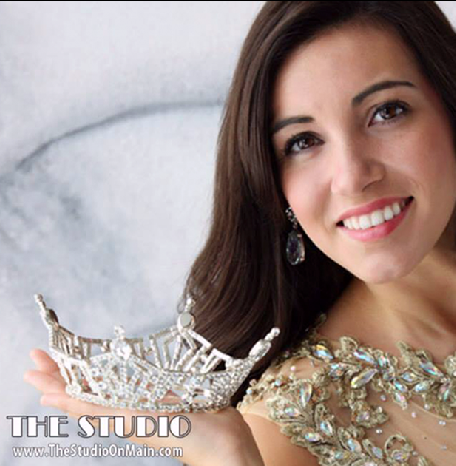 Practices will be held each Saturday morning, starting April 30th, leading up to the pageant on June 4th. Little Miss Sparta is open to girls in grade 1-2, and Jr. Miss Sparta is open to girls in grades 3-5. Contestants must live in the Sparta Area School District. All contestants will learn an opening dance (not judged, just for fun) and will compete in interview, on-stage introduction and on-stage question/walk. There is no cost to enter the pageant. Practices will be held each Saturday morning, starting April 30th, leading up to the pageant on June 4th. Visit MissSparta.com for more information. There will be no car show for 2016. If you or someone you know is interested in hosting this event in the future, please Contact Us. Committee chairs are expected to attend monthly meetings and keep the board/committee up-to-date with event details. We hope to bring this great event back in the future! Our 2016 Lineup is ready to go and we are so excited to share the excitement! 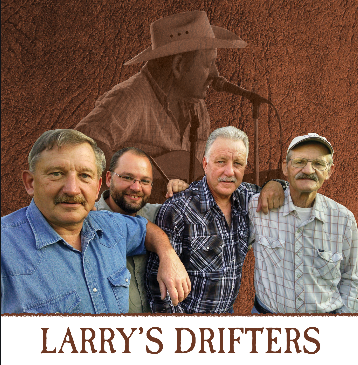 Thursday night, we will be featuring Larry and the Drifters in the fest tent for our VIP Sponsors Reception and kickoff night. 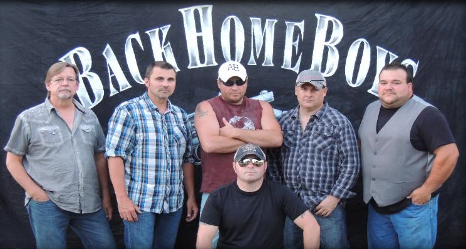 Friday night, we're excited to announce that the Back Home Boys will be back by popular demand! Saturday we're featuring Chasin' Mason, a band who has performed at Milwaukee Summerfest. Sunday, The Dweebs will be on the fest tent stage for our blow out! Check out their videos below and get yourself ready to fest in June! "He’s a tremendously talented ventriloquist, but James Wedgwood is equally talented as an entertainer who always gets his audience involved. His show is simply “The Most Fun You Can Have Without Moving Your Lips!” James uses amazing comic ventriloquism, outrageous characters, and hilarious audience participation to bring truly memorable entertainment to your event. Like a one-man variety show, James makes virtually everything talk – from wooden “associates,” to purses, bottles, and even audience members (yes, they just open their mouths and James provides the surprising words)! A game show, singing (without moving his lips!) and much more are all part of the fun." Be sure to check the schedule for all showtimes! We are excited to announce that, back by popular demand, this year's Friday night Fest Tent Entertainment is the Back Home Boys! Check out their video to see a performance from 2014 in Cadott, WI. The Back Home Boys formed in 1994 as a 3 piece group. very small towns which makes this group even more unique. We are excited to have them back and can't wait to share all the rest of our entertainment plans for 2016! More bands will be announced soon! and will be revealed soon! Thank you to all who submitted designs this year! They were wonderful! OUR 2016 button design contest deadline has been extended! We are currently accepting designs for our 2016 Button Design. The winner will receive $100 and their button will be produced as our 2016 Festival Button. Designs are due by February 12, 2016. Click here for more information. Pictured is last year's winning design by Hadley Bernett, then 8th grader at Sparta Meadowview, as well as other previous design winners.